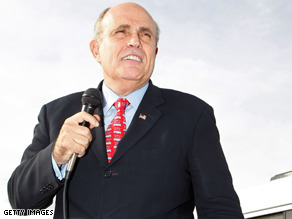 Giuliani hasn't decided on a run for governor. (CNN) - Rudy Giuliani fueled speculation Wednesday he is considering a run for governor with a high-profile op-ed in the New York Times, but the former mayor told reporters he hasn't decided one way or another on a potential run just yet. In a conference call Wednesday morning, Giuliani denied the op-ed - in which he proposes a series of measures to fix the state's gridlocked government - was meant to be a signal he is actively interested in running for governor in 2010. "I know how to send signals, if I wanted to I would do it." Giuliani said. "I am not leaning [in either direction]." In the op-ed, which Giuliani says is "not a partisan criticism," the former Republican presidential candidate calls for a statewide constitutional convention to institute a series of reforms, including changes in the budgeting process, term-limits for law makers, and campaign finance reform. Two polls out this week show Giuliani would easily top current New York Gov. David Paterson in an election match-up, but would face a considerably more challenging bid against the state's attorney general, Andrew Cuomo. Giuliani largely withheld criticizing Paterson directly Wednesday. "There is enough blame for all to share," he said. Giuliani's a career politician with no other options but to run and run and run until the voters get tired of hearing about him and elect him to something. And the media is happy to FORCE us to hear about EVERY politician, past, present or future, OVER AND OVER AND OVER AGAIN. Cuomo will scrub the floor with cross dressing Rudy if he decides to run. Giulianni hasn't done much but be a public spectacle after 9/11.